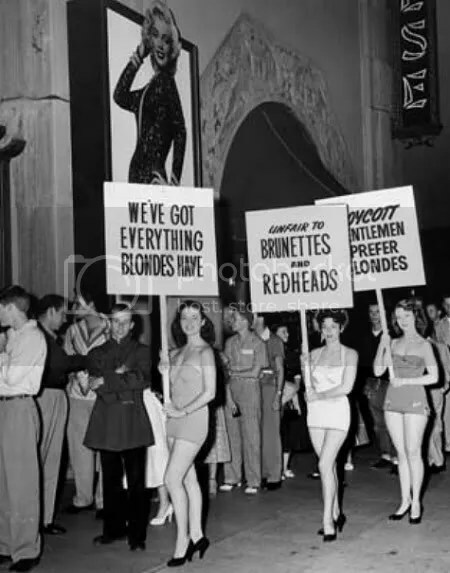 Three young ladies picket in front of a huge cutout of blonde Marilyn Monroe at the Grauman’s Chinese Theater where “Gentlemen Prefer Blondes” is showing. Pickets, left to right: Avis Kimball, Lillian Pacino and Evelyn Bernard. This entry was posted in equality, history, humor, photos and tagged gentlemen prefer blondes, grauman's chinese theatre, marilyn monroe by Tiffany. Bookmark the permalink.